People Matters talks to Anju Jain about her book Step Up: how can women perform better for success, a 360 degree view on the role of women both at home and workplace. 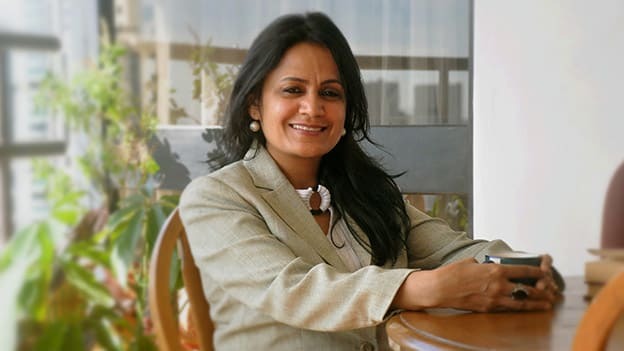 Anju Jain is a leading HR at Caterpillar, India and founder of Chai Pe, a platform for developing professional women. The dichotomy continues to exist despite the change in times. Gender parity is yet a distant dream for many women. Giving a holistic and a fresh outlook to the role of women in the workplace, the book highlights the challenges typically faced by women. It provides a coherent framework and strategies to women on how they can truly step up and perform better at all fronts. Tell us about your book. What led you to pen down this book and what was your experience while writing it? The book is about how women can perform better for success. I have experienced and also witnessed women struggling to perform multiple roles and striving to fulfill their responsibilities and aspirations. The book guides women from all domains to make informed decisions and be aware of the consequences too. It is about making conscious choices. I had conviction in my views and hence was keen on changing this ‘missing women’ scenario in my company and others as well. In fact, this belief led me to start my own organization called ‘Chai Pe’ that worked on grooming professional women so a pipeline of leaders can be created. My book ‘Step Up’ offers a coherent framework and strategies that would help women to succeed. The book also has messages for men, organizations and society at large, as they are very integral to conversation of women in the workplace. Your book talks about, practical strategies that women need to adopt to be successful. Can you briefly tell us about some of the strategies? I talk about four strategies or aligning the four circles to your vision. The first strategy for the woman is to negotiate and onboard herself to the goals she aspires to achieve. If she doesn’t align and commit herself to that, then rest of the strategies won’t hold any ground. The second strategy aims at onboarding her family including her spouse, children, parents and in-laws in the Indian context. She has to take the initiative to share her vision with them, modify it as needed and solicit their support. We all know how critical family support can be in our lives. Onboarding the organization makes for the third strategy. Just like the woman aligned herself and her family to her vision, she has to now align herself to the organization. She has to make the organization aware of her goals, diffuse any perceptions and visibly ask for opportunities and experiences to realize her pursuits. The fourth strategy involves onboarding her external networks that includes her friends, extended family, colleagues and other support systems in her vicinity. It is only when all are aligned with her vision can she actively enlist their help. By engaging and depending on them, she will make herself available to focus on her other pressing priorities. Just like the woman aligned herself and her family to her vision, she has to now align herself to the organization. She has to make the organization aware of her goals, diffuse any perceptions and visibly ask for opportunities and experiences to realize her pursuits. The fourth strategy involves onboarding her external networks that includes her friends, extended family, colleagues and other support systems in her vicinity. It is only when all are aligned with her vision can she actively enlist their help. By engaging and depending on them, she will make herself available to focus on her other pressing priorities. So, in the book you have mentioned that women were in minority in your second job. Do you feel things have changed for women, especially after SEBI guidelines that you need to have one woman director on board. Do you think women representation has gone up in the company boards or are these stereotypes still perpetuated in the society, even in the most progressive organizations? What is your point of view? SEBI guidelines are good to have but they are really at the end of the tunnel. When we don’t really have good senior women in the pipe to begin with, where are we going to find senior women for board positions? We simply don’t have a wide talent pool of women employees with us. There are less than 10% women in senior positions in India. I wish these guidelines are implemented somewhere earlier so we can build that pipeline for the future. From an individual standpoint too, women have to take the lead. The onus still rests on the individual. They cannot solely depend on SEBI and other mandates. Mostly representation of women on board is merely tokenistic in nature as we see next of kin CEOs and Chairman acquiring board position. What is your opinion on this, as there are not many board ready women in the pipeline? I think there is a mixed bag. For some, it may be tokenistic but for others, it may be a serious business. Regardless, we need board ready talent and to have that, we need to start this conversation much ahead in the game. Furthermore, we need to tighten and clearly share the expectations of board roles. What are the responsibilities of these Board members? What powers do these members, especially women hold considering this is a new norm? How can organizations really groom women and have a very strong pipeline? How can we really achieve this? It is not that complicated as we think it is. Organizations first need to determine what’s holding women back. In fact, that answer is also quite widely known today. So the solution is to focus on execution. Have a business imperative, goals, metrics, and a conducive environment for them to grow. If the organization believes that women are not ready for a specific role, identify those competencies and groom them for those. Just like we groom men, we need to groom women. The only additional emphasis I would make is to guide them towards alignment of their circles. If they can do that, more than half the problem is solved. The remaining will be overcome by bringing male colleagues and the organizational infrastructure to support them. Why do you think organizations are not taking steps in this direction? I think it is not a priority. Everyone wants to do it, believes it is a right thing to do, but fail in executing it. The day leaders prioritize and commit to building a diverse talent pool, things will get mobilized. And just like all business imperatives requires focus, governance, resources, and measures, this subject does too. We have to recognize that this change cannot be enabled on the shoulders of volunteers alone. More needs to be committed to get the desired results. As per the recent amendment, the maternity leave is extended to 26 weeks. Do you think it will make things more conducive for working women? It is a welcome step but I am not sure to what extent it will help in keeping women in the workforce for the long-term. Childcare is a life- long role that won’t end after 26 weeks also. This extension will of course give women more time with the baby and alleviate some of their initial challenges. However, I think the more it is extended, the harder it will be for them to resume work. For some women it may work, for many it may be lead to a complete exit. I guess we will have to wait and watch the impact. The bigger challenge will be for businesses- how they will manage those positions for extended periods of time. And once women are back, how will they fit them back into the organization. Implementation may present a challenge. Personally, I would choose paternity leave in lieu of extending maternity leave. If an organization provides 3 months leave to women and 3 months leave to men, then they will be conveying a whole different message. They will highlight that men are as important as parents. And that would create a transformational shift in our society. There is ample research to show that men are capable of nurturing children and families. Such a policy or a mandate will encourage men to step up in the family realm and relieve women of this burden so they can focus on their aspirations as well. For a sustainable solution, both men and women have to collaborate and co-parent. What is your advice to working women and men? To women, I will say, follow the four strategies I talk about. They are simple and practical. Be clear about what you want to do in your life. You want to be full-time parent or working professional, the choice is completely yours. Make conscious choices. Two, ask for help unabashedly. Just like it is delegation and teamwork at work, the same has to be done at home too. Take help from every corner one can. To men, I will say, partner in this conversation. We absolutely need them to take a seat at home. Slowly, an abundance of these engagements would blur the stereotypes and permeate in the society to enable a sustained change. All of us need to step up in tandem. Vani Vyas is Assistant Manager - Content with People Matters.